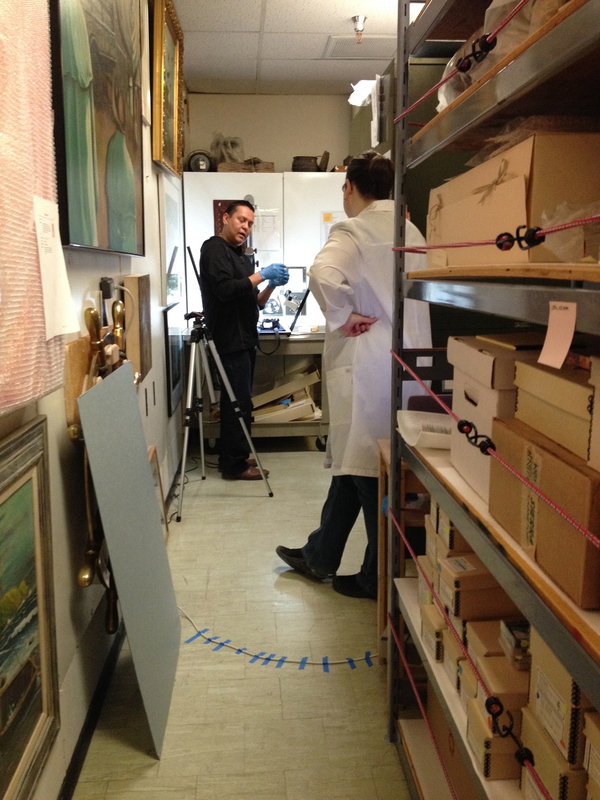 At the Pratt Museum, we spent this past Saturday and Sunday photographing collection pieces from the Sugpiaq Catalog. Thanks to the generous support of Museums Alaska, we were able to contract with Daryl Kreun, Port Graham photographer, to work with us for two days on this project. While there are still unphotographed items in the collection, we were able to document 201 pieces at this time. 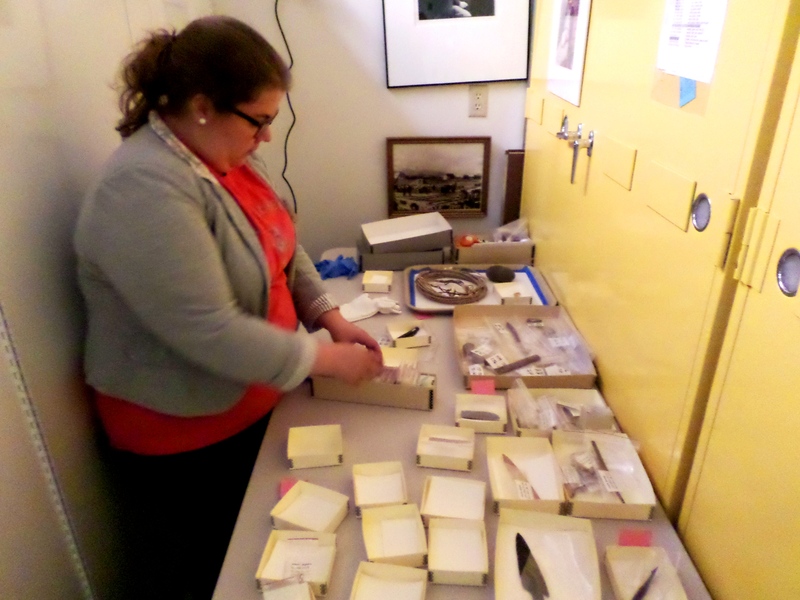 Collections Manager Savanna Bradley and I pulled several pieces from the storage units of the Cultural Collections in preparation for this event. As we had limited space to work with, we simultaneously pulled and re-shelved items as we completed the work. Savanna Bradley working on organizing selected pieces for photographing. We also set up a light table for Daryl to work on while documenting the pieces, then discussed various ideas regarding the best approach to each item. 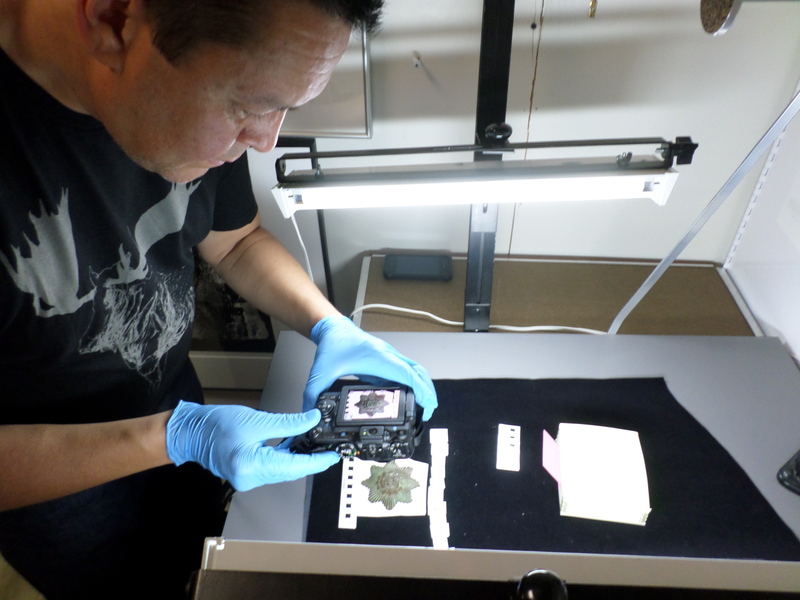 Because we were documenting not merely for scholarly review and use in museum projects but also for use in origin communities, we focused on producing photos that allow viewers to see details from multiple vantage points. Daryl Kreun and Medeia Csoba DeHass discussing photographing strategies. Depending on the material and condition of an item, they can be stored in either cabinets or on shelves. Some pieces, such as iron, requires a specific microclimate, while others, as for instance stone, does well in a general storage area. All items are marked with a specific accession number when accepted to the collection and subsequently placed in the appropriate cabinet and unit. 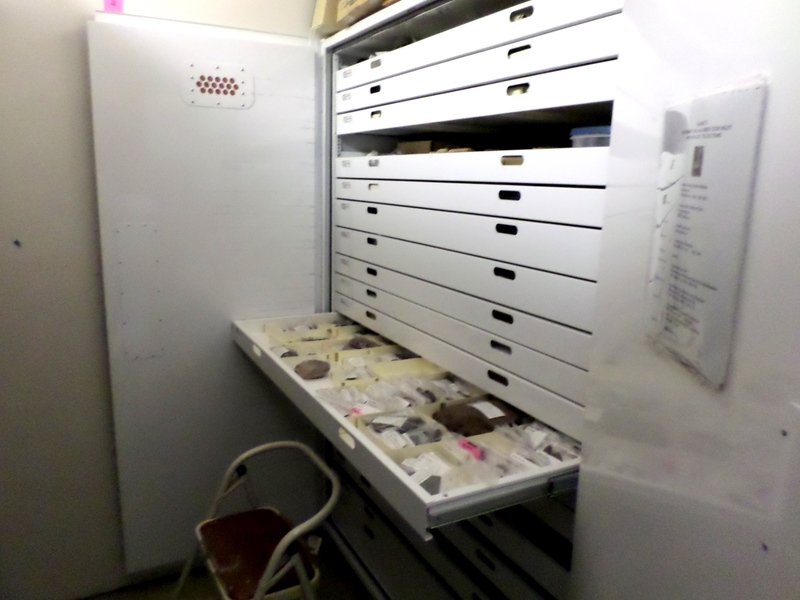 Storage cabinet in the Partt Museum’s Cultural Collection room. As we have over 3,200 pieces on the Sugpiaq Catalog list including archaeological findings, contemporary art, photographs, digital media, audiotapes, and ethnographic pieces, we selected items based on their condition, whether or not they have previously been photographed, and the connections they may have to other collections in origin communities. 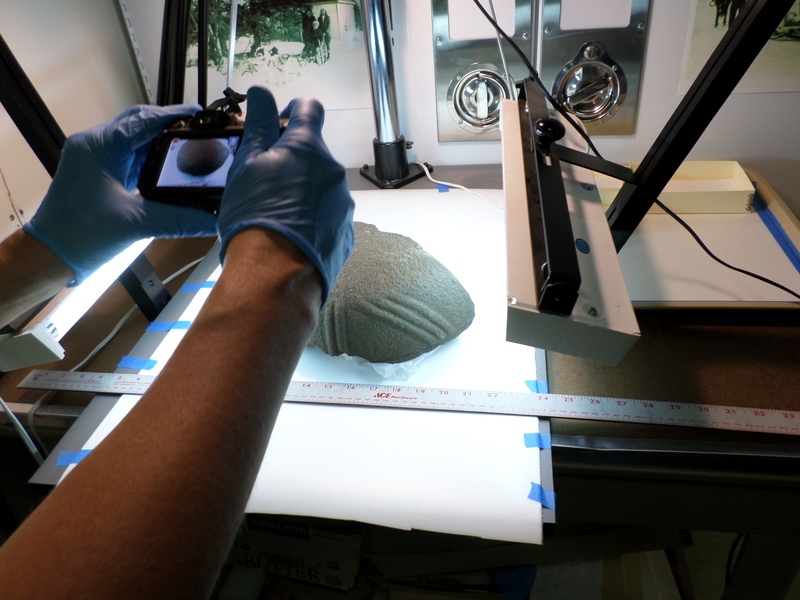 Daryl photographing the bottom of an oil lamp fragment with grooved decorations (PM 1993-163-0606). Daryl working with the previously mentioned Russian badge from Nanwalek (PM 1976-019-0001). This recently donated metal Russian Orthodox Cross originates from Yukon Island. 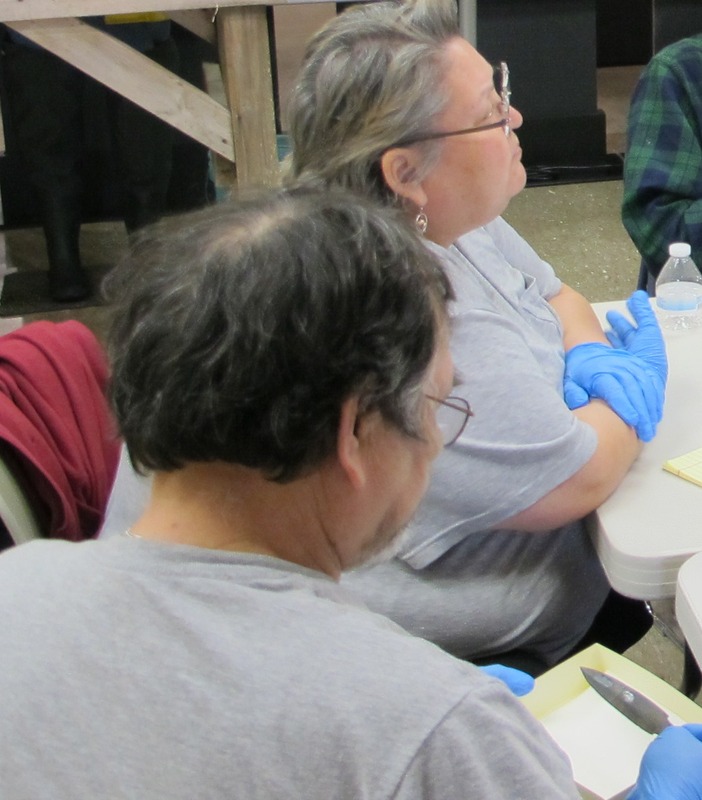 It was featured in a recent Homer News article and examined by community representatives during the workshop. It was also described as a burial cross at the University of Alaska Fairbanks by Dr. Katherine Arndt (PM 2014-009-0001). The cross does have quite a bit of corrosion, but also appears to be fairly recent. 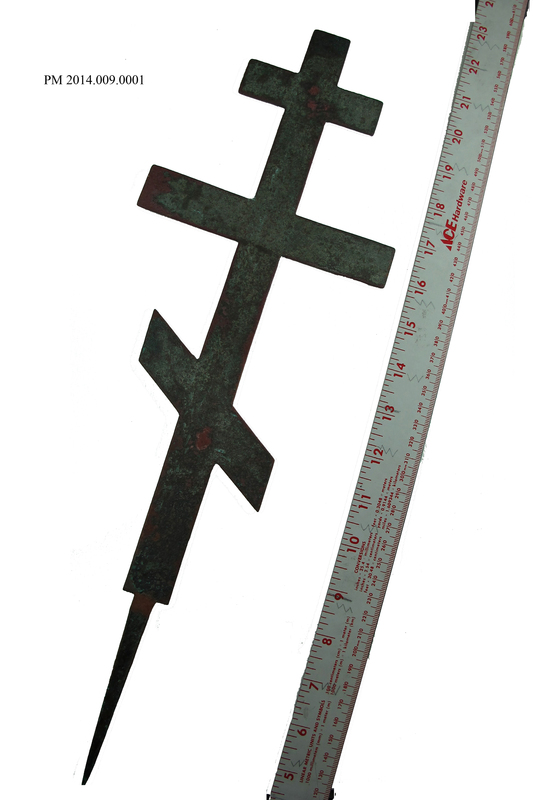 While there was a re-burial of repatriated human remains on Yukon Island, Ephim Moonin, who is a sub-deacon at the Sts Sergius and Herman of Valaam Russian Orthodox Church in Nanwalek and participated in the reburial service, described the cross used to mark the grave as red and made of wood. The recently found and donated cross is made from copper. This decorative button from a priest’s or bishop’s vestment (PM 1998-039-0001) is also from Yukon Island. Both of these items are interesting to note, as I have not (yet) found any documentation of Russian Orthodox Church activities on Yukon Island. Please let me know if you know otherwise. 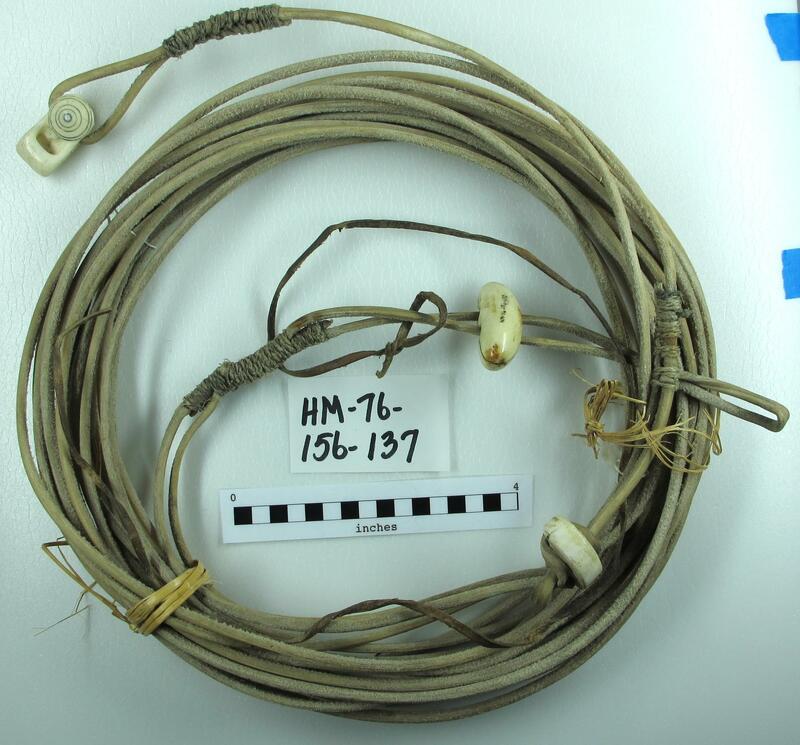 Described in the catalog as a baidarka cord with ivory carvings (PM 1976-156-0137), this item was identified by Ephim Moonin and Herman Moonin during the workshop, as well as by John Kavsnikoff during his visit to the Museum, as having been made of dried kelp and not sinew. One of the most fascinating collection pieces is the bone carving (PM 1993-163-0665) below. Its function and purpose has eluded most of us who handled it in the past, until Daryl turned it around and realized it was a small, elaborate carving of an animal’s head. To us, it looked like a moose. What do you think? 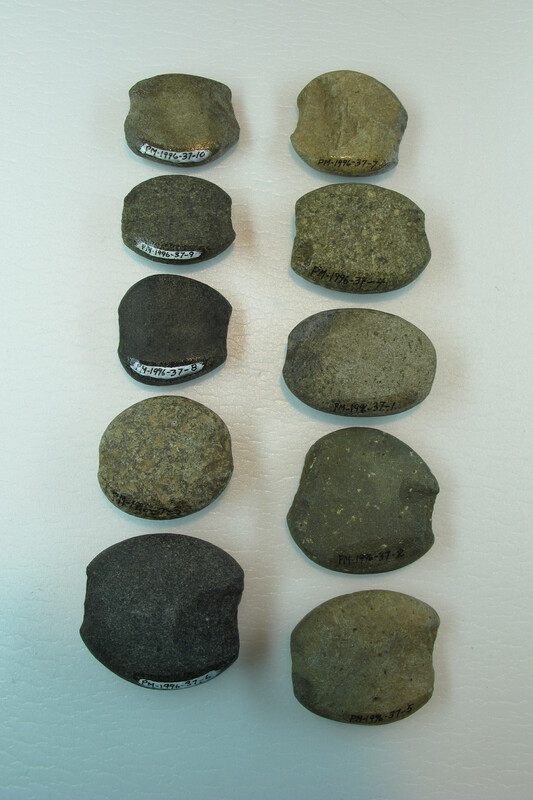 A photo showing the size differences of all notched net-sinker stones from Nanwalek. 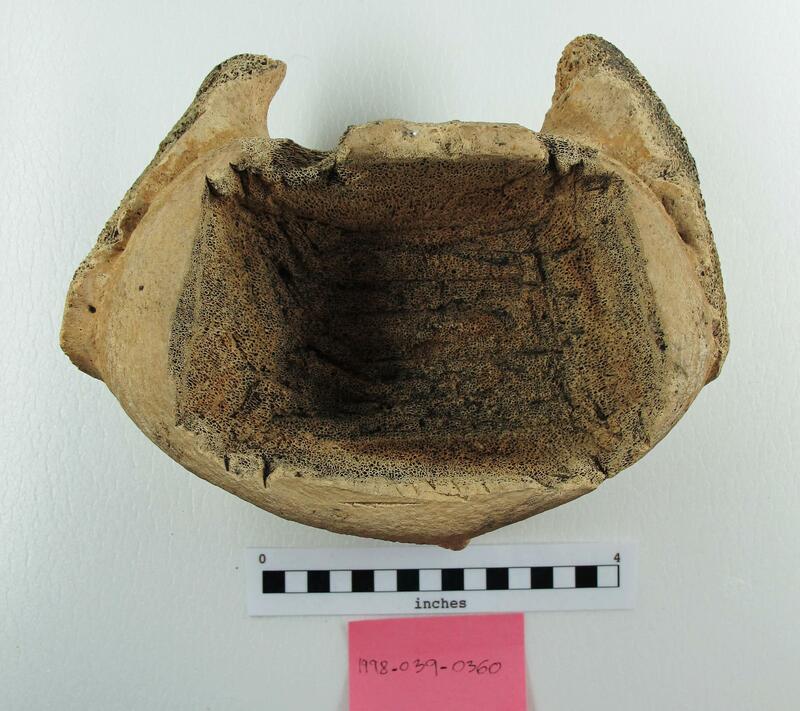 These all were donated by Nick Tanape, Sr.
A whale vertebra carved out as a bowl from Yukon Island (PM 1998-039-0360). John Kvasnikoff remembered that her family also used to own a similar whale bone piece while growing up. 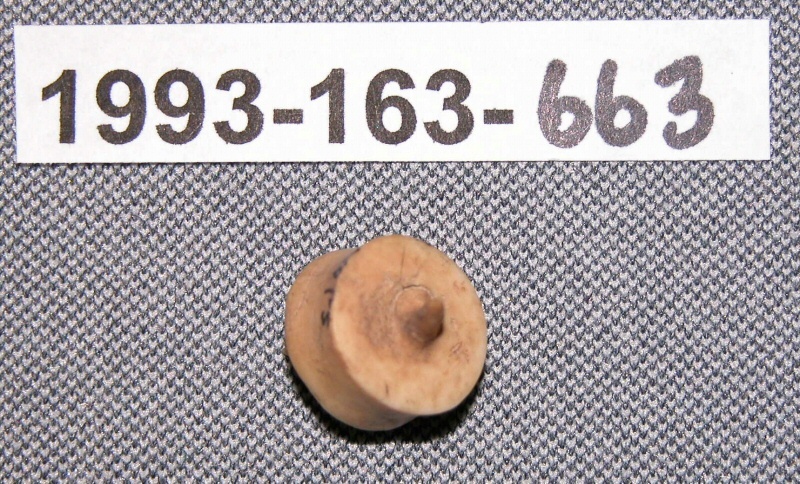 Alma Moonin described beads similar to this one from Yukon Island (PM 1998-039-0012) as “squirrel eyes.” She used to hear her mother, Juanita Melsheimer, refer to these red and white beads as such. The final photo I selected to share today is a personal favorite of mine. 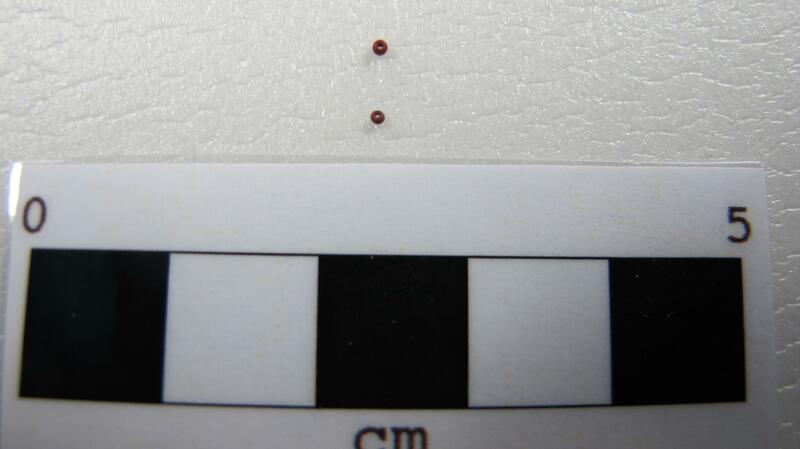 These minuscule beads are also from Yukon Island (PM 1998-039-0058 and PM 1998-039-0059) and I simply cannot imagine how people were able to work with them. Perhaps they used very thin sinew or hair? I do not think I have seen thin enough bone needles that would have fit through these. The scale below is in cm to give you an idea on their size (1 cm = 0.4 inches). 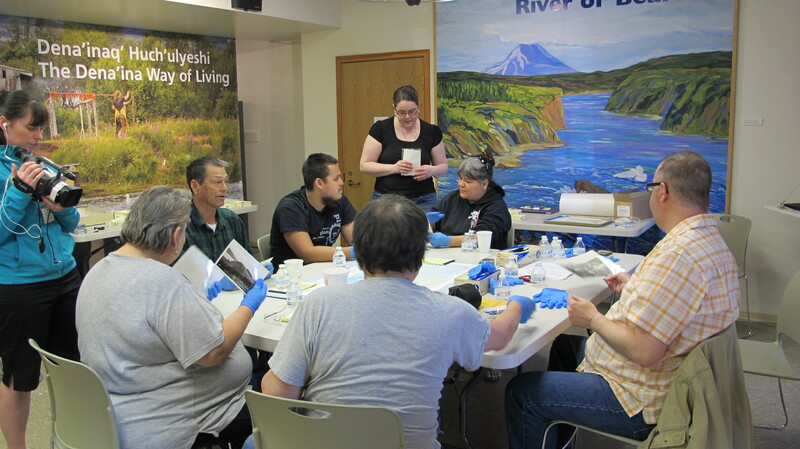 As part of the Lower Kenai Peninsula Material Culture and Heritage Preservation project, generously funded by Museums Alaska, we had a busy few days at the Pratt Museum. 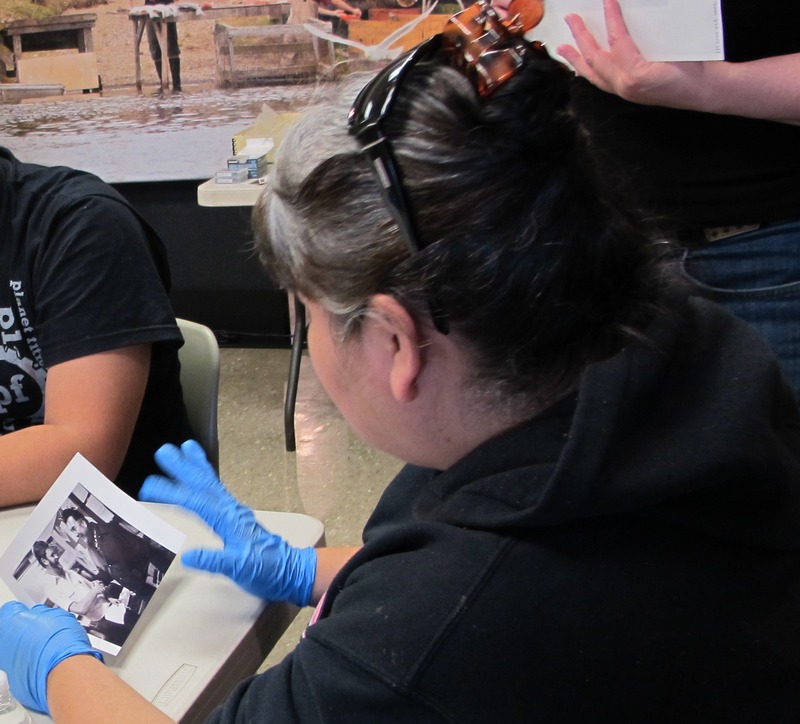 We had Alma Moonin from Nanwalek completing training on general museum collection care. 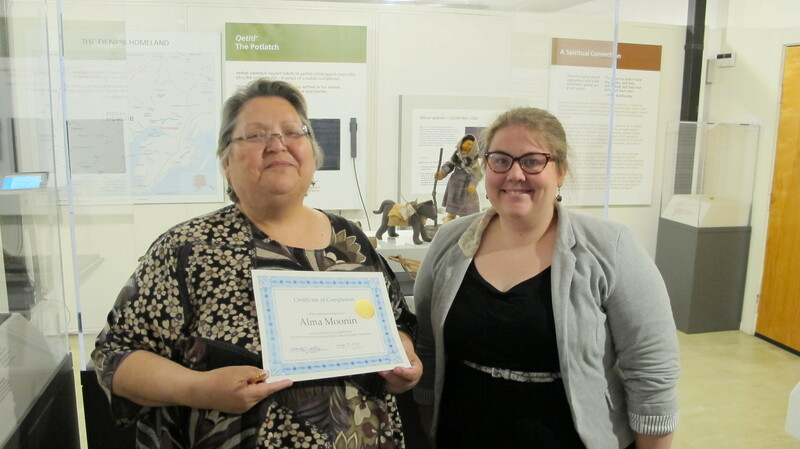 Alma worked with the Pratt Museum’s Collections Manager, Savanna Bradley, on learning about developing a mission for the Nanwalek Museum, accessioning, caring for collection pieces, and strategizing on securing funding. For the following day, we had a full-day workshop planned. Unfortunately, our plans to fly participants over from Port Graham and Nanwalek were foiled by the raging fires and smoke. As all planes were stranded for the larger part of the day, our original participants, Christalina Jager and Mary Malchoff from Port Graham, as well as Kathy Brewster, Emilie Swenning, and Rhoda Moonin from Nanwalek were unable to attend. I would like to thank them for their time in preparing for the workshop, for generously agreeing to attend, and for tirelessly working with us setting up the event. Quyana! I hope we will have the chance to host them at the Pratt Museum as part of a future project. Ephim and Alma Moonin, who were already over on the Homer side, were fantastic in helping us contact additional participants. Herman Moonin graciously agreed to join us to represent Port Graham, while Kathy Evans and Vladimir Moonin also made time to participate in the workshop. Thank you all for coming over to the Pratt Museum on such a short notice, sharing your insights and knowledge, telling stories, and reflecting on the collection pieces – Quyanaakcak! 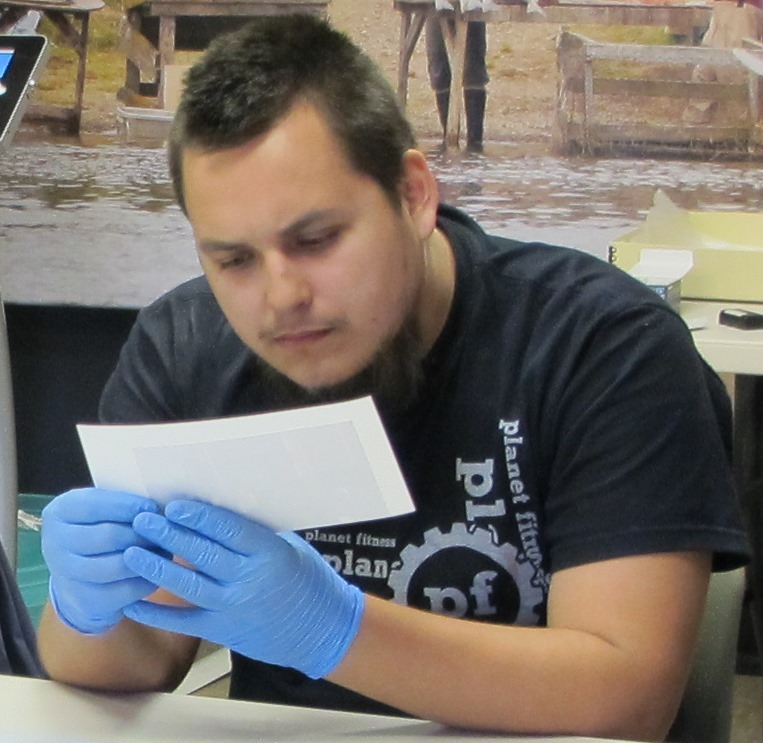 We looked at a selection of artifacts that ranged between 3000-100 years in age originating from the larger Sugpiaq area. 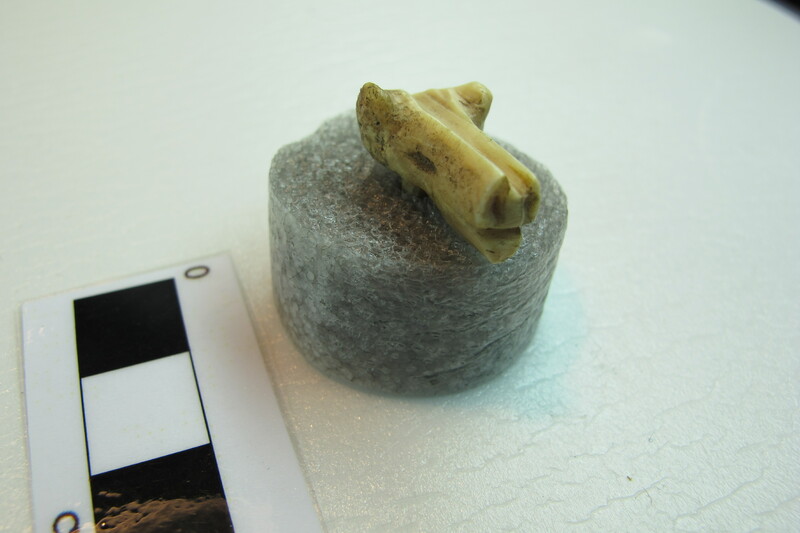 Some of the pieces were from Kodiak Island, while others were excavated on Yukon Island, at China Poot Bay, and on other locations around Kachemak Bay. We looked at barbed and toggle points, a slate ulu, labrets, the Russian Medallion I previously posted a photo of, trade beads, china fragments, a U.S. military hat pin from the 1850s, various charms carved out of ivory, and the recently discovered Orthodox Cross from Yukon Island. 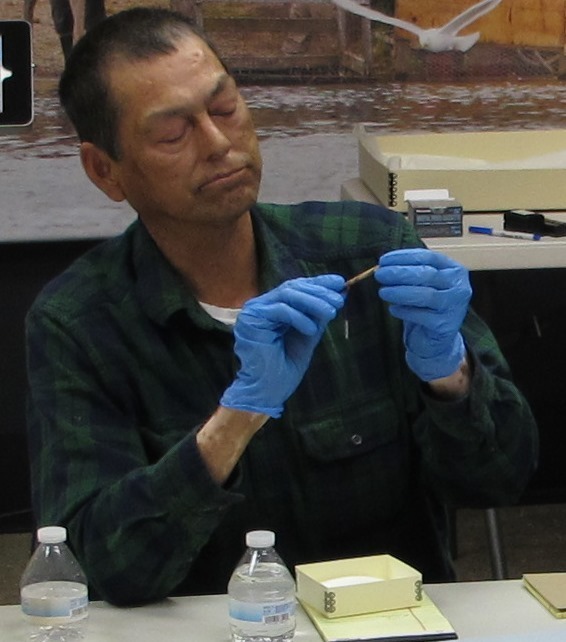 Herman examining a barbed ivory point. Kathy identifying Vincent Kvasnikoff and one of the teachers in Nanwalek. Vladimir looking at one of the historical photographs. Ephim studies a slate point while Alma discusses archaeological excavations in the region. 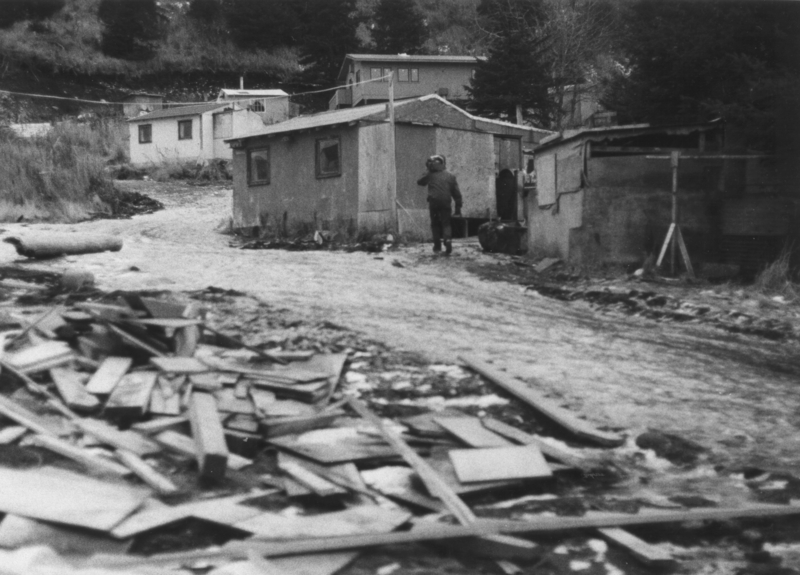 We also looked at a great selection of historical photographs depicting life in the lower Kenai Peninsula Sugpiaq region in the past hundred years. 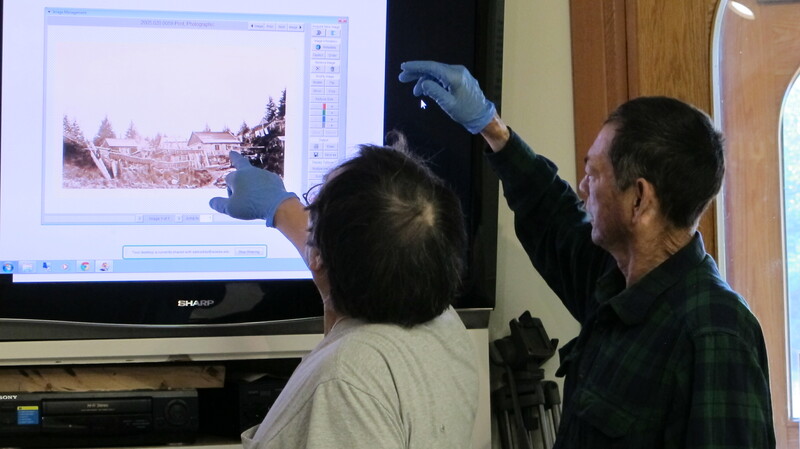 Ephim and Herman identifying one of the photos from the Smith Family collection depicting the Chief’s house in Port Graham in the 1930s. I would like to thank Savanna Bradley for her dedication in setting up and overseeing the collection pieces for the workshop as well as Ryjil Christianson, the Director of Education at the Pratt Museum, for all her hard work in recording the entire event and producing excellent video footage. We will send copies of the event to both communities for local use as well as provide all participants with personal copies. The final event of this project is to take photos of selected collection pieces. Port Graham photographer, Daryl Kreun, will be working with us all weekend (May 25th and 26th) to document the collection. If you are in town, please feel free to stop by! This week I am posting two photos I promised a few weeks back to various people interested in the history of the lower Kenai Sugpiaq region. The first photo is the one I mentioned on Facebook’s Sugpiat message board last week asking for input whether to keep it on the Sugpiaq Catalog list or not. 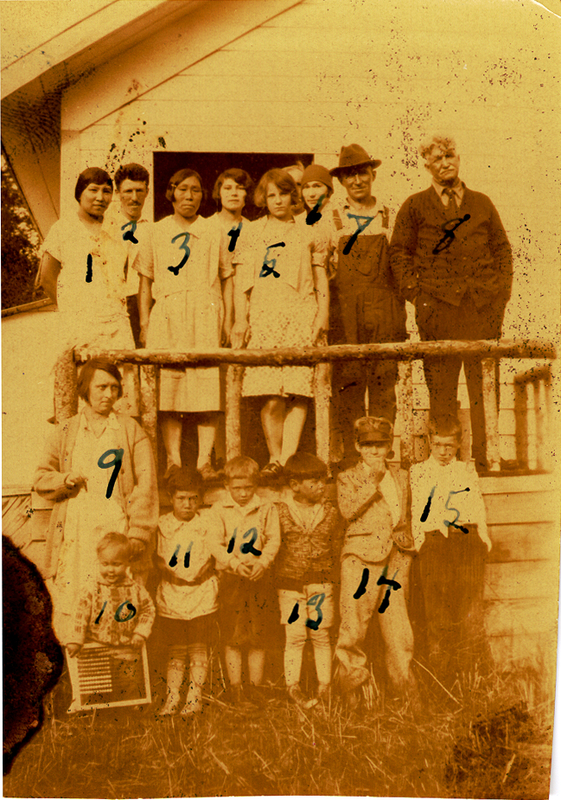 It is from the Theresa Graham Mickelson Historic Photograph Collection (PM – 2002.019.0015) and it features a great number of people living in Homer in the early 1900s. 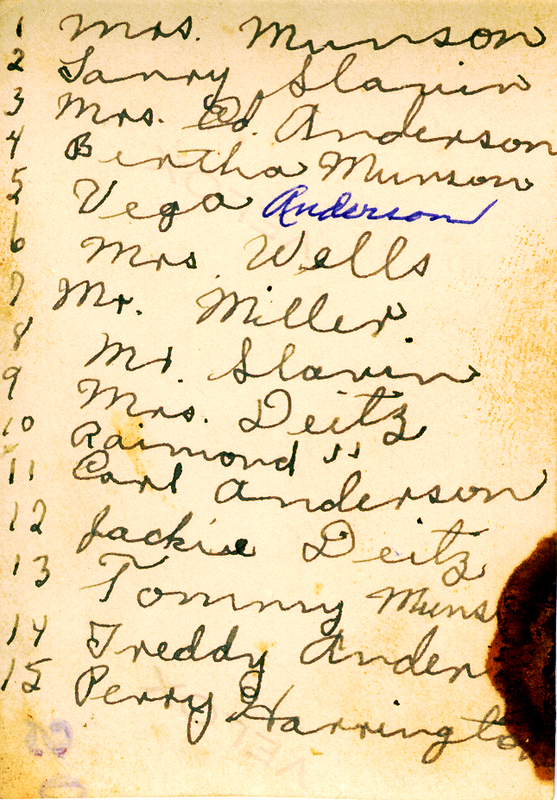 I am posting both the front and the back of the photo, as it contains the original handwritten list of the names of the people depicted on the picture. For an easier review, I am also listing the names here as they correspond to the numbers. 1. Mrs Munson, 2. Larry Slavin, 3. Mrs. Ed Anderson, 4. Bertha Munson, 5. Vega Anderson, 6. Mrs. Wells, 7. Charlie Miller, 8. Mr. Slavin, 9. Gladys Deitz, 10. Raymond Deitz, 11. Carl Anderson, 12. Jack Deitz, 13. Tom Munson, 14. Fred Anderson, 15. Perry Harrington. The photo was taken in front of the schoolhouse. Also, the photo collection has an accompanying oral history collection written by Theresa Graham Mickelson available at the Pratt Museum. The second photo (PM – 1990.002.0001) is from Bear Cove in Kachemak Bay. It is taken from a boat on the water and it shows Ted Pedersen’s buildings standing close to the beach in Bear Cove. 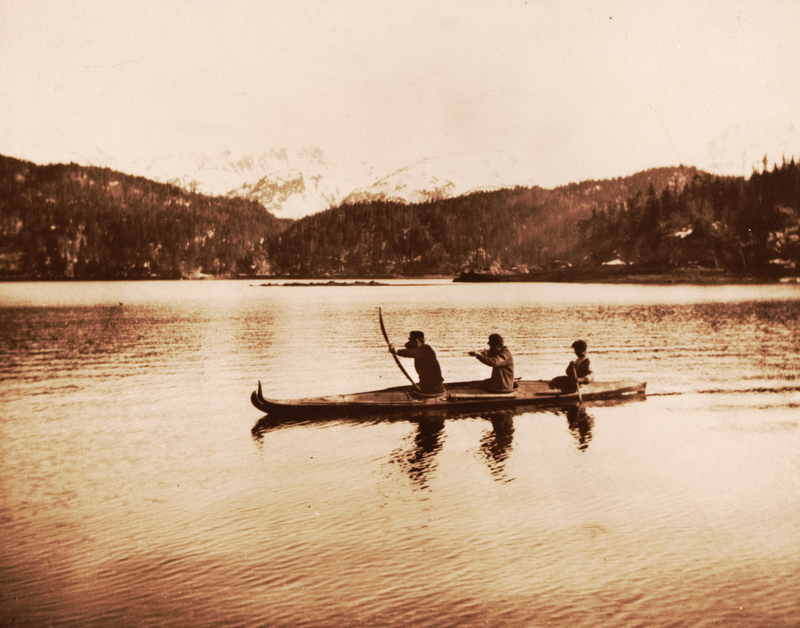 Ted Pedersen was originally from the Aleutians, and he settled down with his wife, Elsa, in Bear Cove in the mid-1900s. Details on the story of the Pedersen homestead can be found in Elsa Pedersen’s book “Kachemak Bay Years: An Alaska Homesteader’s Memoir.” As part of the Sugpiaq Ethnohistory project, I recorded interviews with participants on information they felt they wanted to share about the history of Nanwalek and the region. One of the participants, Nina Kvasnikoff, described her life living in the Bear Cove / Halibut Cove area as a child. She mentioned that her family used to visit a man by the name of Pedersen on a neighboring island. 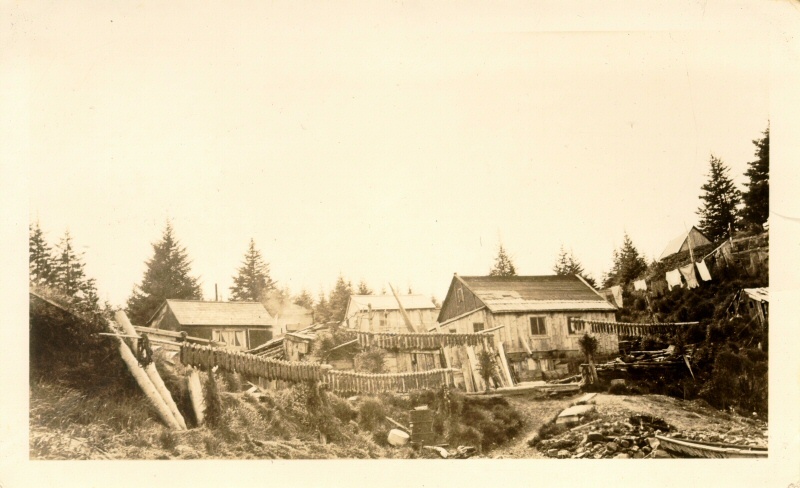 Ted Pedersen was their closest neighbor, although many newcomers tried their luck with homesteading and fishing for the canneries in Seldovia. 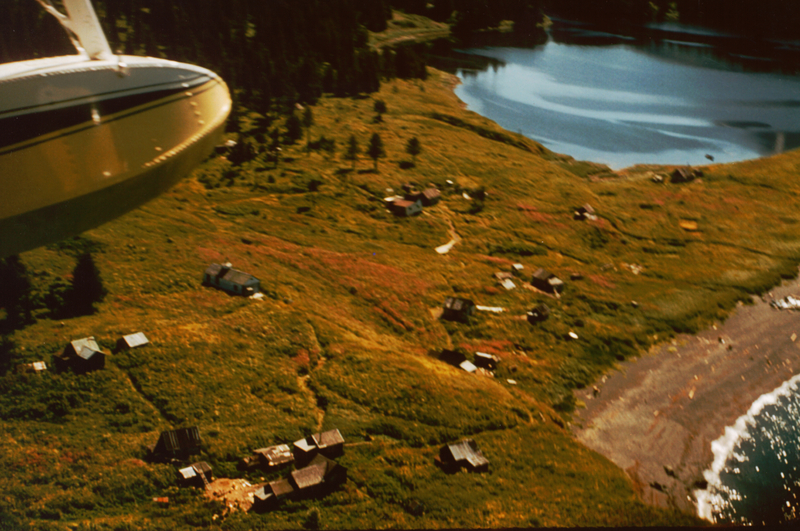 Nina and her family left the remote island homestead behind after the 1964 Good Friday Earthquake and moved to Seldovia that offered greater security. Yesterday, March 27th, was the 50 year anniversary of the Earthquake and the subsequent Tsunami that claimed over 130 lives in Alaska, Oregon, and California. This week, a gentleman donated a series of issues of The Frontiersman, a biweekly newspaper published in Seldovia. The collection covers several issues of the paper mainly from the year 1947. Savanna Bradley, the Collection Manager of the Pratt Museum, kindly took the following photos relating to the history of Nanwalek and Port Graham while reviewing and accessioning these items. Chris Moss Historic documents and newspaper collection, Pratt Museum – The Frontiersman. According to the information I was able to find on The Frontiersman, it was a twice weekly newspaper published in Seldovia starting in 1946 on each Wednesday and Saturday. In 1947, the editor was Viola Daniels, and subscription cost 75 cents for a month. 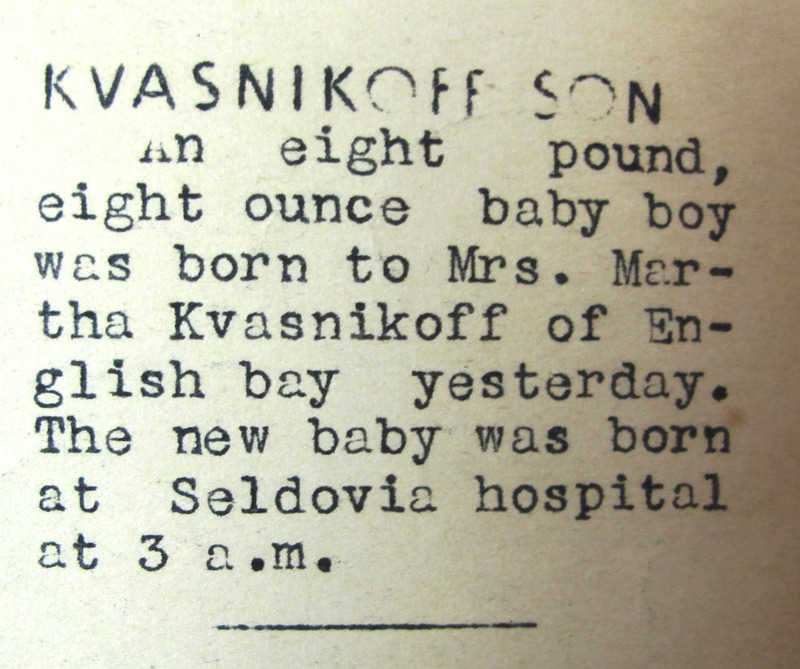 A baby boy was born to Mrs. Martha Kvasnikoff of English Bay. The fish pie recipe from the past from Martha Mumchuck. Interesting to see that potatoes were just as popular as rice, which indicates a shift in cooking practices and the availability of certain ingredients when compared with today’s popularity of rice. Perhaps, gardening was still prevalent in the 1940s and most people had easier access to potatoes they grew than today. N.d. Kenneth S. Cohen Collection. Fairbanks, AK: Arctic and Polar Regions Archive, Elmer E. Rasmuson Library, University of Alaska Fairbanks. Here are three photographs from the Pratt Museum’s collection connected to John Herbert and Passage Island. I have mentioned him in a post a few years ago, when I was working with the Alaska Commercial Company (ACC) collection in at the Archives in Fairbanks. According to documents in the ACC collection, John Herbert purchased buildings from the ACC in Seldovia. He also helped people in Nanwalek purchase the ACC building that had become a part of the old Church. Many Elders in Nanwalek have confirmed that the building was bought for two sea otter pelts. Apparently, there were a few men in Nanwalek who worked for Herbert. These men told him that they wanted to buy the buildings that the ACC left behind, as by 1899, the ACC had closed down the store in Nanwalek for a variety of reasons. Nevertheless, Herbert sent the following letter to the ACC offices on Kodiak. Please keep in mind, as with all historical documents, I kept the original spelling, grammar and capitalization of letters. From a letter dated 1902 December, we know that Herbert had purchased the Seldovia Buildings, but he did not mention the ones in Nanwalek. Therefore, it was interesting to see photos of this man, John Herbert, who had, perhaps unknowingly, secured a part of the old Church building that became a cornerstone of Nanwalek’s and the region’s history. Today this building, the old Sts. Sergius and Herman of Valaam Churach, is on the National Register of Historic Places. Apparently, he also purchased or rented the area on Passage Island and used it for farming foxes. Courtesy of the Steve Zawistowski historical photograph collection – PM 1982-046-0008 – Pratt Museum Photo Archives. For reproduction, questions, and permission outside of Fair Use please contact the Pratt Museum. Courtesy of the Steve Zawistowski historical photograph collection – PM 1982-046-0006 – Pratt Museum Photo Archives. For reproduction, questions, and permission outside of Fair Use please contact the Pratt Museum. 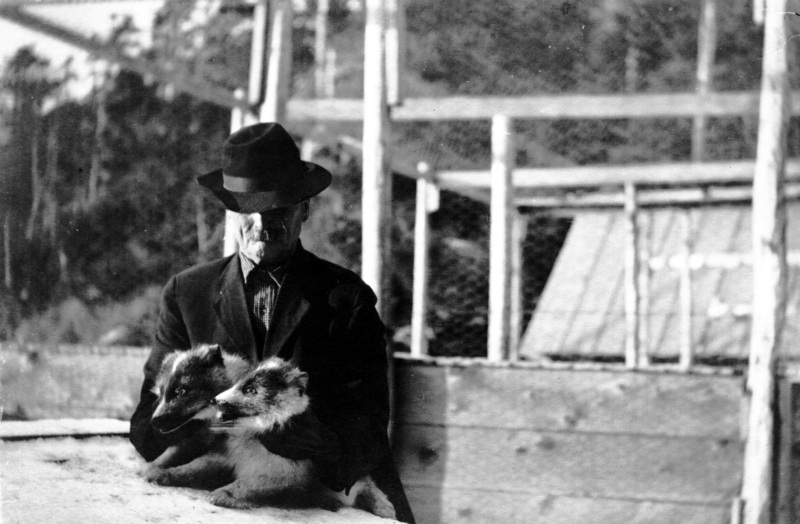 A photo of John Herbert with two blue foxes on Passage Island. Courtesy of the Steve Zawistowski historical photograph collection – PM 1982-046-0002 – Pratt Museum Photo Archives. For reproduction, questions, and permission outside of Fair Use please contact the Pratt Museum. 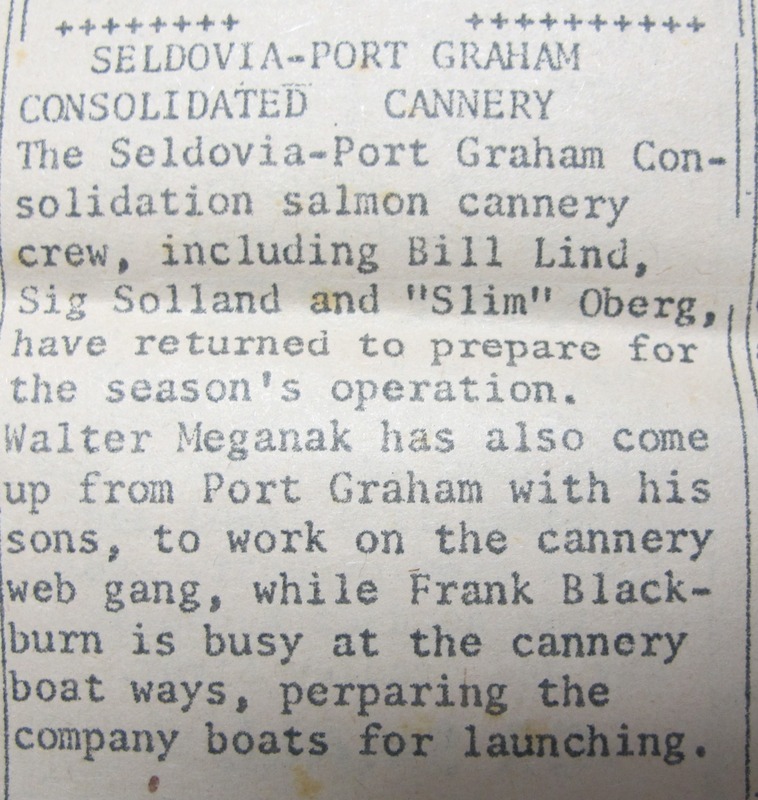 I was also going through the newspaper collection and found two small articles in the Cook Inlet Courier – one pertains to Nanwalek and one to Port Graham and Seldovia. 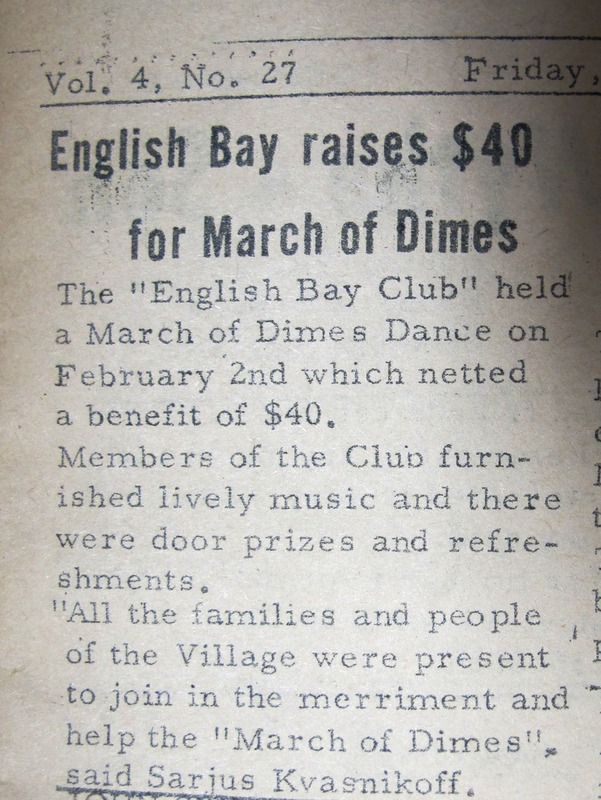 English Bay Raises $40 for March of Dimes – 1963. Cook Inlet Courier – February 15, 1963 – Vol. 4, No. 27. Cook Inlet Courier – February 15, 1963 – Vol. 4, No. 27 – Courtesy of the Pratt Museum historical newspaper collection archives. For reproduction, questions, and permission outside of Fair Use please contact the Pratt Museum. 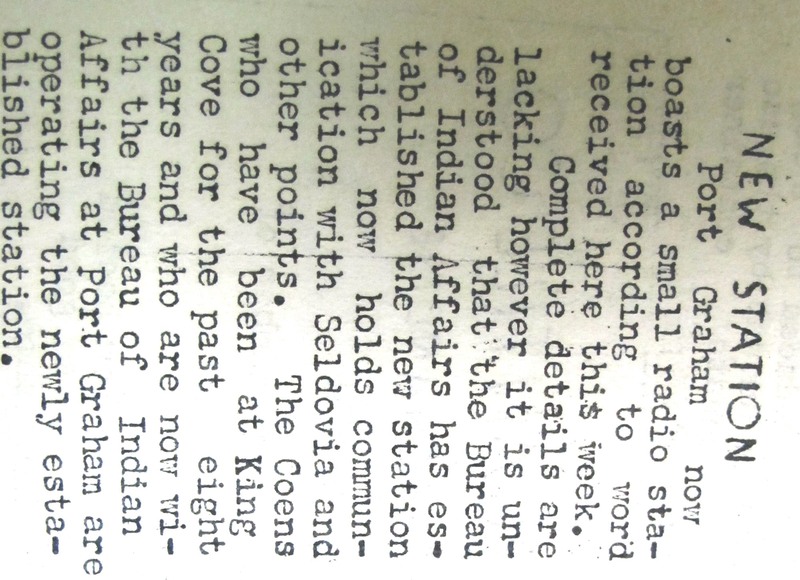 Cook Inlet Courier – May 15, 1964 – page 14 – Courtesy of the Pratt Museum historical newspaper collection archives. For reproduction, questions, and permission outside of Fair Use please contact the Pratt Museum. Courtesy of the Toby Tyler historical photograph collection – PM 2001-014-0006 – Pratt Museum Photo Archives. For reproduction, questions, and permission outside of Fair Use please contact the Pratt Museum. According to the Pratt Museum’s catalog this aerial photo of Nanwalek (PM 2001-014-0006) was taken sometimes between 1956 and 1974. The old church is clearly visible on the hillside with one of the small paths leading to it. I was surprised to see how much of the bluff was still intact. Wondering if this photo was taken closer to the 50s or the 70s? Courtesy of the Jan Aphelin historical photograph collection – PM 2003-046-0082 – Pratt Museum Photo Archives. For reproduction, questions, and permission outside of Fair Use please contact the Pratt Museum. This village scene in Nanwalek (PM 2003-046-0082) is from 1982. It was taken as part of the Housing and Urban Development Project for the North Pacific Rim before the houses and apartments were built. I thought this was the road that passes by the Eagle building and the store, but I am not sure if this is correct. What are the buildings/homes and are there any still standing? Courtesy of the Pratt Museum Photo Archives – PM 1976-019-0001. Donated by Sarjus Kvasnikoff. For reproduction, questions, and permission outside of Fair Use please contact the Pratt Museum. 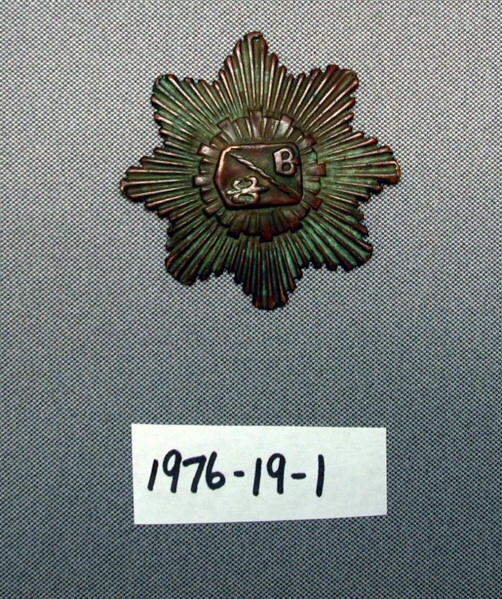 The photo of this medallion (PM 1976-019-0001) might seem familiar to some of you. It was donated to the museum by Sarjus Kvasnikoff in the 1970s, who had found it in his garden in Nanwalek. The museum record does not say where the garden was, but I thought most gardens were down on the airport. It would make sense if this medallion came from airport, as it is Russian in origin. So finding it in the vicinity of where the fort must have stood seems plausible. The museum catalog had it identified as French, due to the fleur-de-lis symbol and the closed crown, but with some hours of internet research from Dave we figured out it was Russian. It is probably a badge that lower ranking officials wore on their chests. It is a thin copper plate embossed with the design measuring about 2 and ¾ inches in diameter. Courtesy of the Pratt Museum Photo Archives – PM 1993-163-0663 (SEL 010-87-142). For reproduction, questions, and permission outside of Fair Use please contact the Pratt Museum. The last item on the list (PM 1993-163-0663) is somewhat of a mystery. 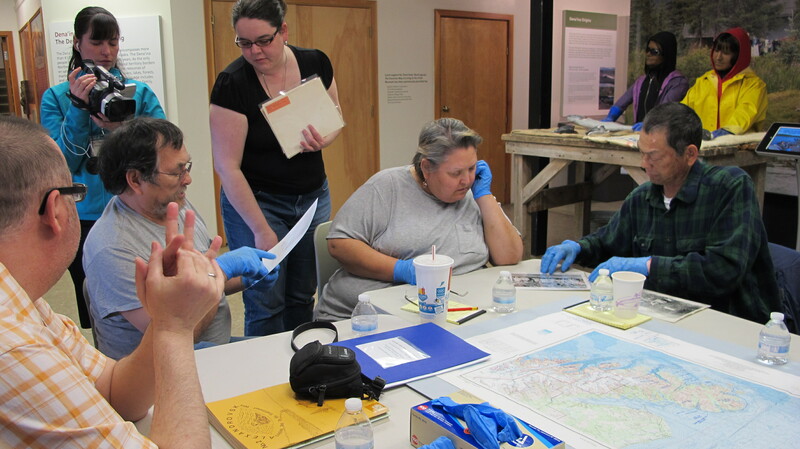 It came to the Pratt Museum as part of an excavation in the Kachemak Bay area. 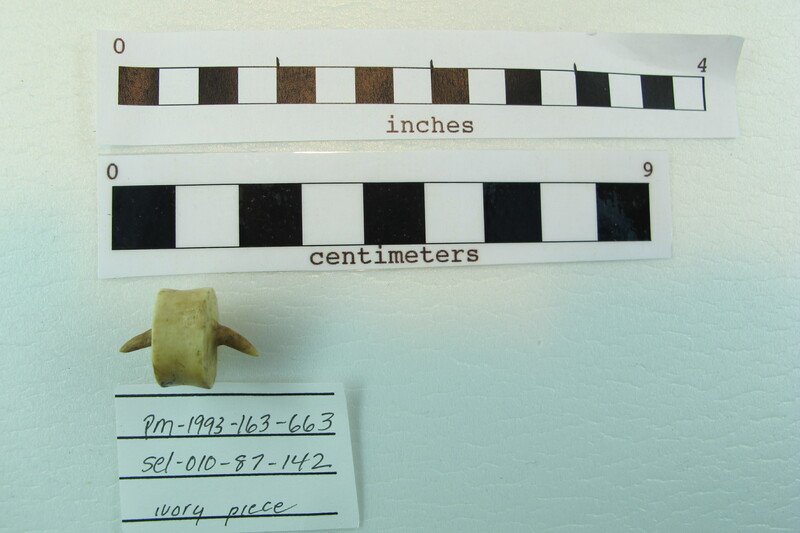 It is a carved ivory object from the Kachemak Tradition (so it is approximately 3000 – 1400 years old) that is less than an inch long. The way the photo is was taken makes it difficult to see the entirety the item, but the round, wheel like shape has that thin, horn-like shape carved out of it on both sides. It almost looks like as if would fit into another piece that was carved to go with it. It is done in great detail and has a smooth surface. Any ideas what it could have been for? Courtesy of the Pratt Museum photograph collection – PM 1999-001-0003 – Pratt Museum Photo Archives. 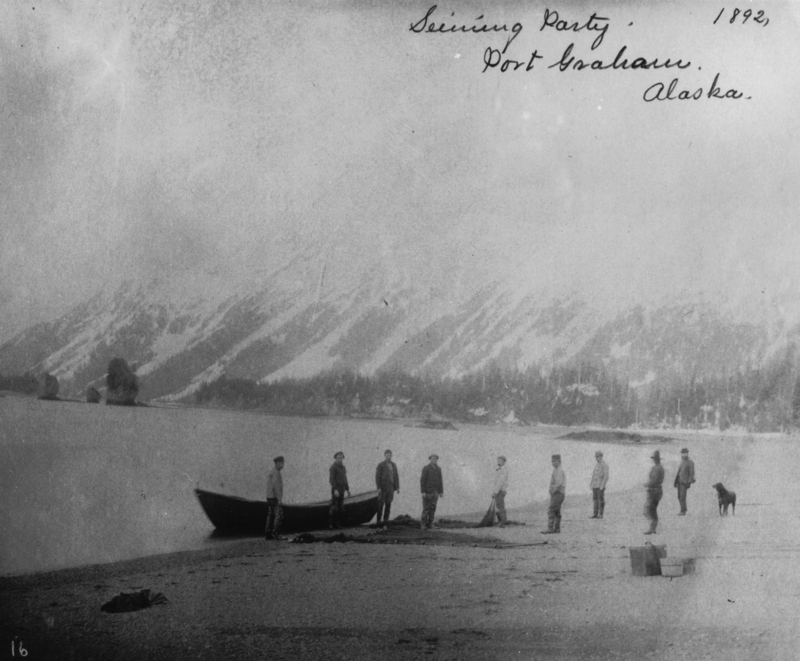 This photo of a seining party in 1892 at Port Graham is originally from the National Archives (NARA) (22-FFA-461), but a copy is available at the Pratt Museum (1999-001-0003). According to the National Archive’s copyright policy this is a publicly available record and as such, it may be used without written permission. They ask users to credit the National Archives and Records Administration. Courtesy of the Ragnar Krogius photograph collection – PM 1994-068-0001 – Pratt Museum Photo Archives. For reproduction, questions, and permission outside of Fair Use please contact the Pratt Museum. This photo of a qayaq with three hunters is originally from the Etholen Collection of the National Museum of Finland and is copyrighted outside of fair use. The Pratt Museum’s call number is 1994-068-0001 at the Ragnar Krogius Collection. 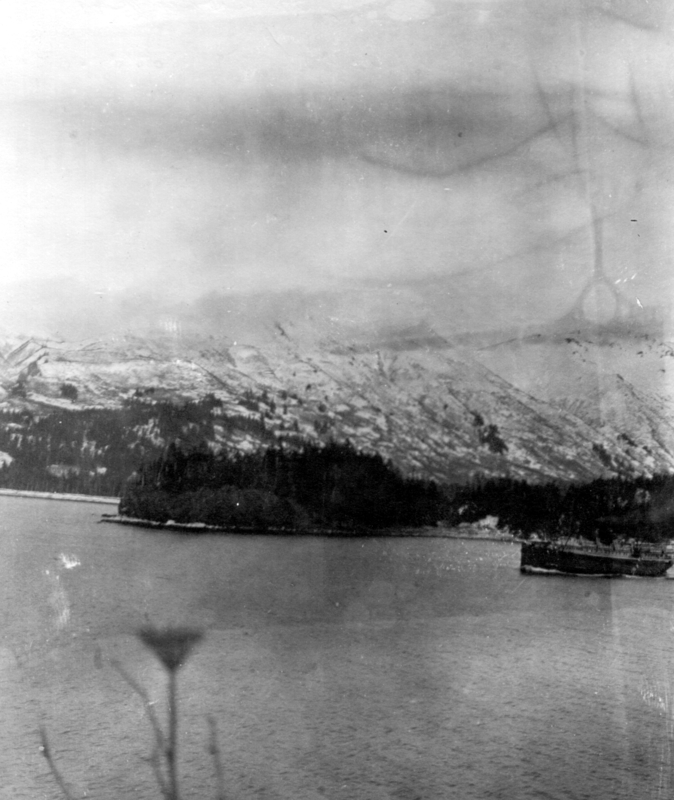 The photo was taken around Port Axel in Bear Cove. Most likely, these are hunters from Nanwalek or one of the temporary settlements on the Outer Coast. The man in the middle seat seems to have a gun while the man in the front seat seems to have a bow and arrow. I know people used to hunt with various kinds of spears, atlatls, bolas and harpoons, but I do not think I have heard much about bows. Perhaps some of the hunters might have some updates on this. Courtesy of the Ragnar Krogius photograph collection – PM 1999-002-0002 – Pratt Museum Photo Archives. For reproduction, questions, and permission outside of Fair Use please contact the Pratt Museum. 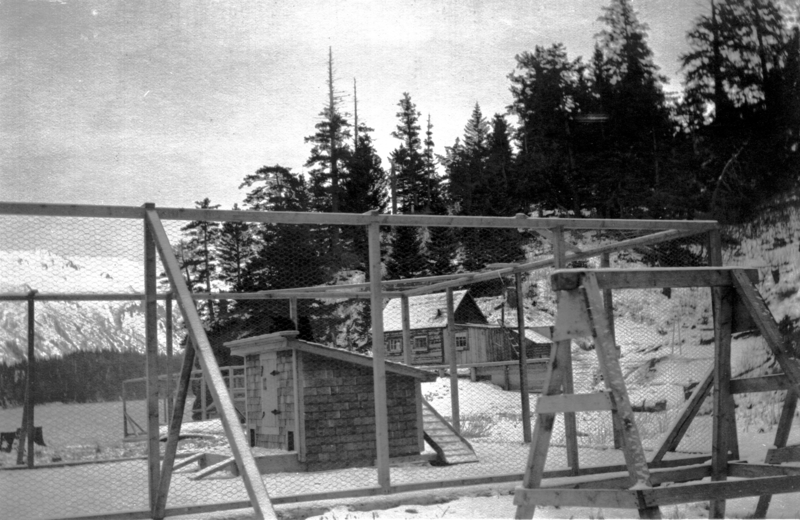 From the same collection (Ragnar Krogius), this photo (1999-002-0002) is of a log home near Port Axel from November of 1905. Originals are at the Etholen collection of the National Museum of Finland. 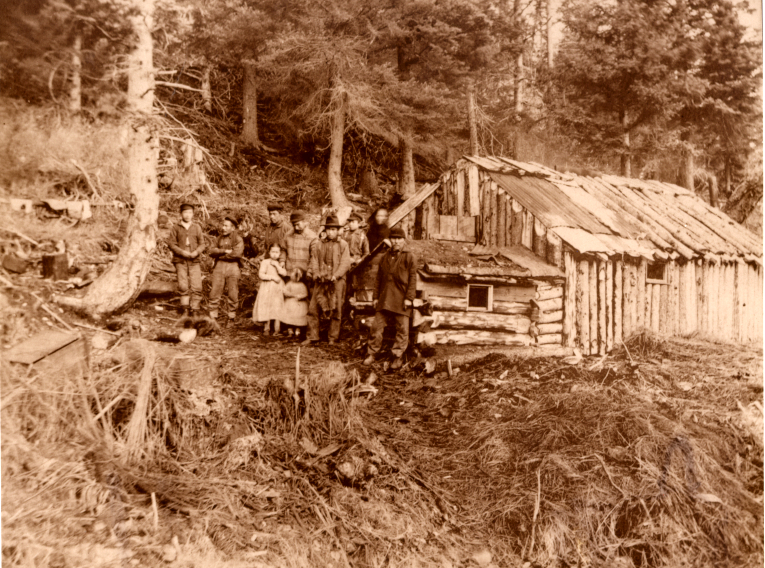 Courtesy of the Smith Family Historic photograph collection – PM 2005-020-0059 – Pratt Museum Photo Archives. For reproduction, questions, and permission outside of Fair Use please contact the Pratt Museum. The last photo for today is from the Smith Family Collection (2005-020-0059), and it shows the “Chief’s House” in Port Graham. 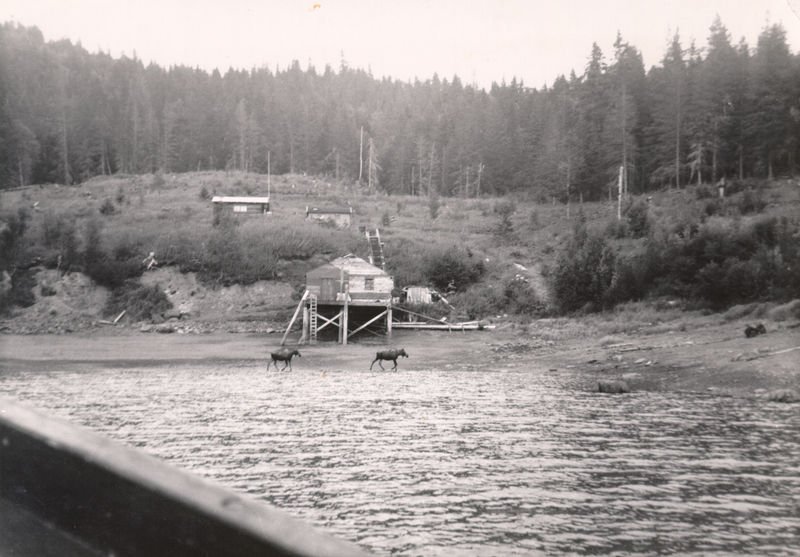 The Smith family used to live on Passage Island and in Aurora Lagoon. They farmed foxes, tended the lighthouse, fished, and the wife, Mary Elizabeth Smith, also taught at the Port Graham School. Digital copies of her diaries from the 1930’s are available at the Pratt Museum. They do not mention the Chief by name, but I was wondering if anybody might recognize the house or knows who the chief was in Port Graham in the 1930s. As usual, please feel free to leave comments here or on Facebook. Any information is much appreciated.